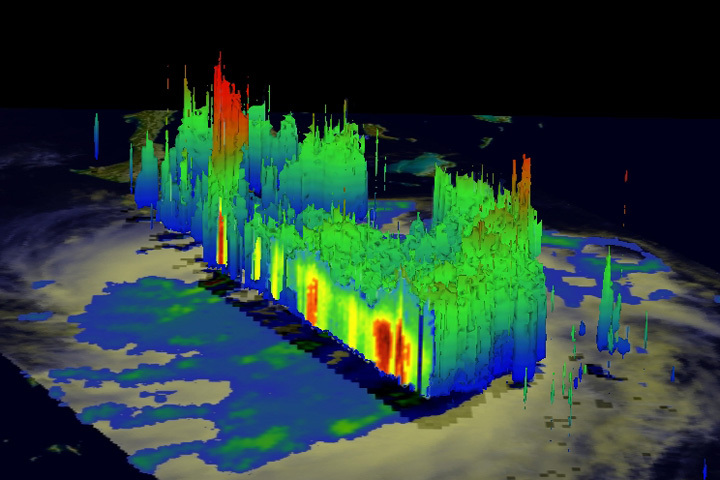 As Hurricane ‘Irene’ intensifies in the Caribbean, NASA offers this perspective revealing “an area of deep convection (shown in red) near the storm’s center where precipitation-sized particles are being carried aloft. These tall towers are associated with strong thunderstorms responsible for the area of intense rain near the center of Irene seen in the previous image. They can be a precursor to strengthening as they indicate areas within a storm where vast amounts of heat are being released. This heating, known as latent heating, is what is drives a storm’s circulation and intensification.” For more, click here here to be taken to NASA’s Earth Observatory.